These are websites I’ve worked on, some on my own, some with others. More recently I’ve been working for the University of Edinburgh, mainly on sites only accessible to university staff and students, so I can’t link to that work. You can see much of my mockups and in-progress work on CodePen, and some experimental work on my play.gregtyler site. The University’s course selection website didn’t appear to be aimed enough at students. Path was designed to combat this, by providing a website that told students what they needed to know about a course, rather than the minutiae that the university stored. Find out how to access Path with this short guide. 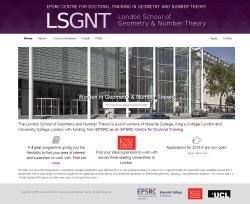 Working under the Croft Media banner, I helped design and build a website for a new mathematics school in London, led by three of the city’s main universities. Building from scratch, this improved creating an admissions system and an administration portal. 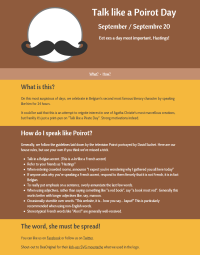 A personal project, I thought that “Talk like a Pirate Day” was a bit too immature and created the print pun of “Talk like a Poirot Day”. 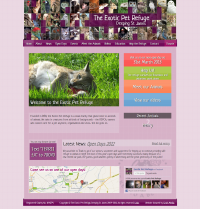 Working under the Croft Media banner, I helped make a site for Deeping St James’ Exotic Pet Refuge to promote their online presence, and tell people more about the work they do.